The Ulster Farmers’ Union says farmers are fed up with bovine TB and it is time to robustly tackle all factors, including wildlife, that contribute to the persistence and spread of this destructive and costly disease. 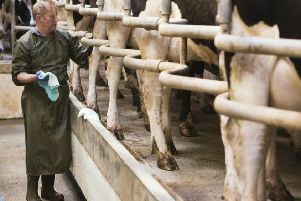 The comments were made following the publication of Comptroller and Auditor General’s report on Eradicating Bovine TB in Northern Ireland. UFU deputy president, David Brown says while there are many recommendations in the report farmers can get behind there are others they simply could not. The UFU says it has consistently argued that Northern Ireland cannot continue to focus on just one side of the TB problem. “Cattle are one part of the equation and there are many regulations and controls in place. Wildlife is the other major contributor in the continuation of this disease. Tackling TB in wildlife must be a top priority,” said Mr Brown. The UFU says while the report does help to reaffirm some of the recommendations of the TB Strategic Partnership Group (TBSPG), it has not fairly reflected the work farmers have put in to tackle TB. Given the current difficult financial climate, the UFU says it recognises funding is tight and it is likely DAERA will be doing less at a time when industry needs them to do more. In its response to DAERA’s consultation on implementing some of the recommendations from the TBSPG, the UFU proposed a ground-breaking, self-help solution in the form of a disease levy with the initial focus specifically on tackling TB in wildlife. “The establishment of a statutory/compulsory levy, controlled by farmers and held by an industry body, would help to address bovine TB,” said Mr Brown. The UFU says it continues to monitor the situation but without a Minister, there is little hope of progress. “TB is one of the many issues being held up by the lack of a devolved government. We need our politicians to get back to work in order to see movement on this critical issue,” added the UFU deputy president.